Check out these tips on starting your calves out right. Each stage of a calf’s nutritional program is important to ensure a healthy and profitable calf crop. A sound and well-managed feeding program is critical after birth to allow a good foundation for calves. In addition to water, colostrum and milk replacer, a calf starter should be fed after birth. 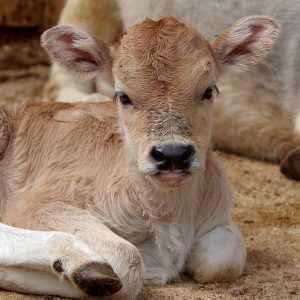 Because calves are born without a functioning rumen, it is critical that a calf starter is offered 1 to 3 days after birth. The fermentation from water and feed are needed to properly develop a calf’s rumen. Delaying calf starter intake can delay rumen growth, ultimately delaying the age at which calves can be weaned. Calves can be started on feed with a handful of calf starter. As they eat the feed, offer them more starter until they are eating as much as they want. But be careful not to overfill the feed bucket because calves like to lick the bottom of the feed bucket while they are eating. This will also prevent the feed from becoming stale and spoiling. Calf starter should be checked daily to make sure the feed is clean and fresh. Spoiled grain should be removed every day. A divider between the feed bucket and water or milk bucket can prevent having to discard wet feed. In addition to feeding a good quality calf starter (at least 20 percent protein), make sure calves have access to clean, fresh water. A good rule of thumb for water consumption to follow is 4 pounds of water for every pound of starter calves eat. Free choice water should be offered to calves 1 to 2 days after birth. Water consumption will encourage feed intake, leading to faster growth and earlier weaning age. Calf starter intake is a primary factor for weaning calves. Instead of making weaning decisions by age alone, evaluate the amount of starter eaten by calves. A good goal to work up to is making sure calves are eating about 2 pounds of starter for three consecutive days. For consistency, calf feeders should measure out 2 pounds of starter to know what that amount looks like. It is recommended that calf starter be fed to at least 12 weeks of age for strong feed consumption through the stress of weaning, grouping, moving, vaccinating and dehorning. From there, the calf can be transitioned to a grower feed, formulated for optimal rumen development. Following these calf starter tips will help fuel your calves’ growth and their performance, allowing them to achieve maximum growth at an earlier age which will strengthen your farm’s bottom line. This entry was posted on Tuesday, December 18th, 2018 at 10:44 pm	and is filed under Cattle, News & Updates. You can follow any responses to this entry through the RSS 2.0 feed. Both comments and pings are currently closed.